Do you want to have the power to turn your website visitors into subscribers and customers? If so then grab a copy of OptinMonster today. OptinMonster, a robust customer acquisition and lead-generation plugin for WordPress that allows you to create highly effective optin forms that are guaranteed to maximize your growth. It’s a web application built using WordPress to help improve your lead generation efforts. OptinMonster allows you to convert your website visitors into subscribers and customers. It has all the awesome features like A/B split testing, page level targeting, reporting, exit-intent tracking, and not to mention the powerful OptinMonster builder. Over 70% of visitors who abandon your website will never return, and most websites capture less than 1 email for every 200 visitors. That’s a lot of marketing dollars and effort going to waste. In a perfect world, you would be able to convince everyone to buy your product or subscribe to your blog. However in a real world, you can probably convince between 5-18% of them to subscribe and soon after purchase the product. Most WordPress Popup Plugins or lead generation solutions are buggy and will slow down your site. They wanted to create a solution that actually worked without breaking your site. They went ahead and created a custom solution for you sites and client projects. When you ask expert bloggers what is the one thing they wish they did when starting out? The response is build an email list. You don’t even know how many subscribers you’re missing out on. All OptinMonster users have seen subscriber growth, some as high as 600%. OptinMonster Design Builder allows you to create visually stunning optin forms that are optimized for the highest conversion rates. OptinMonster comes with a “What You See Is What You Get” design customizer that allows you to create beautiful optin form designs. It is extremely easy to use for beginners and advanced users alike. Don’t want to create a custom optin form? 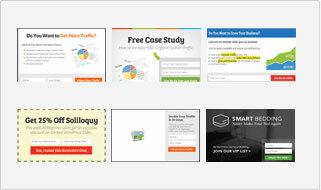 Then use one of our professionally designed pre-made templates that are tested and proven to work. Typography is very important when it comes to design. 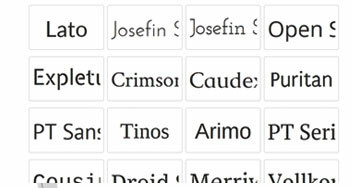 OptinMonster integrates with the Google web fonts library to give you a wide-variety of font choices. OptinMonster allows you to choose from one of the many highly effective optin types, so you can maximize your subscriber growth. OptinMonster WordPress popup optin type is by far one of the highest converting optin type available. With advanced controls and professionally designed templates, we allow you to display people pleasing popups that positively increase signups. OptinMonster floating footer bar allows you to display subtle call-to-action. The footer bar sticks itself to the bottom of the window and scrolls with the user. This uses B. F. Skinner’s positive reinforcement theory to increase your optins. OptinMonster offers a slick slide-in optin that slides up from the bottom right corner. This popular effect is known to convert visitors into subscribers and customers. Slide-in effect is utilized by some of the most well-reputed websites on the internet. 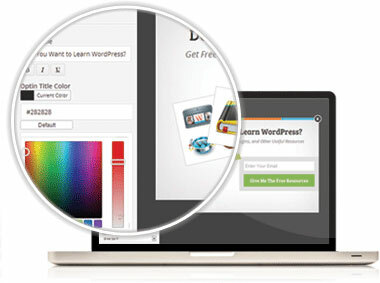 OptinMonster full page take-over effect allows you to show premium landing pages without effecting your SEO. This is reportedly the best converting optin method. They’re still testing this in beta, and this feature will be available soon. OptinMonster signature side-slide effect allows you to utilize the app like interface to display beautiful call-to-action scrolling from the side. This people friendly optin type is their favorite. Side-slide is in beta and will be available soon. With OptinMonster page-level targeting module, you can easily target specific pages by entering the page ID. 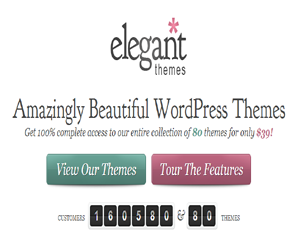 This is great if you have landing pages on WordPress for specific products or services. OptinMonster also has the option to broaden the display even further by targeting specific WordPress post type such as posts, pages, or any other custom post type. For example, if you have a coupons custom post type on your site, then you can show them a lightbox to signup for your coupons email list. If you’re running an eCommerce site using WooCommerce or any other WordPress eCommerce plugins, then OptinMonster allows you to build an even more targeted list to increase your sales. Aside from the WordPress controls, OptinMonster seamlessly integrate with the core grouping and segmenting functionality of your email provider. Currently, we support Aweber, MailChimp, Constant Contact, Campaign Monitor, and MadMimi. The API integration allows you to leverage the grouping feature rather than having to create separate lists. Most WordPress optin plugins do not have this feature. Since OPM team understand the value of hyper-targeted lists that’s why they made sure to include the best features. Use their page-level targeting module to build a targeted email list and improve your open-rates and overall email conversions. Over 70% of visitors who abandon your website will never return. OptinMonster exit-intent technology keeps your marketing dollars from going to waste. OptinMonster track user’s mouse gesture and velocity as they browse through your website. This allows us to detect the precise moment the user is about to leave the page, so we can show them a targeted campaign. Using the OptinMonster exit-intent, you gain an extra opportunity to retain that user and turn them into a subscriber and potential customer. With exit-intent, they make sure that your marketing dollars are not going to waste. Using OPM design builder and page-level targeting module, you can create targeted campaigns for users who’re leaving your site. Exit-intent module gives you an extra opportunity to turn the abandoning user into a subscriber and shortly after a customer. No more guessing on what works. Try different content, headlines, layouts, and styles to see what converts best with our smart and easy to use A/B testing module. A/B Split testing is one of the most desired features, but normally it is extremely hard to setup. Well, we changed that. 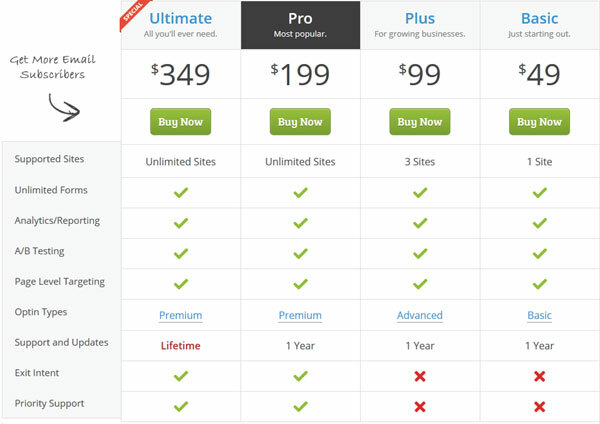 OptinMonster A/B Testing Module is extremely easy to use. 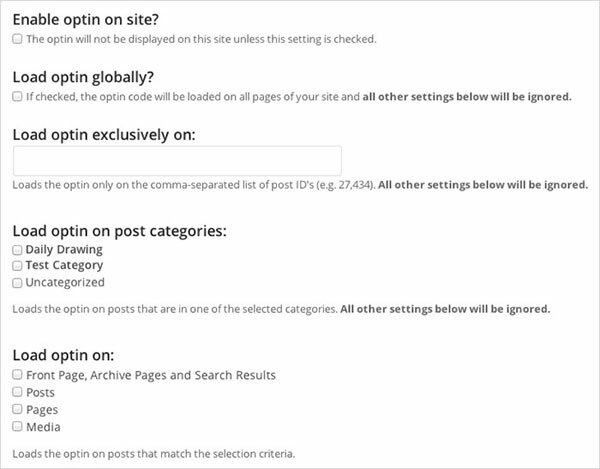 All you have to do is click on the Split test button, and it creates a replica optin. Next, you simply use our design builder to make any necessary tweaks and that’s it. The plugin does the rest for you. It randomly serves each option to see what works best for you. OPM stats module track impressions and conversion for each specific optin. These numbers will clearly indicate which option works best for you. Using these insights, you can make educated decisions and significantly grow your email list. Analyze clicks, views and overall conversion rates to see which page or optin style is converting the best, so you can improve your strategy accordingly. Most people don’t know what to do with analytics because they don’t understand them. OptinMonster changed that by eliminating the fluff and only showing what really matters. OptinMonster tracks the number of impressions, total conversions, and the conversion rate. You can see the reports for each optin and utilize various parameters for better overview. OptinMonster also tracks the referral page for each conversion thus giving you a better understanding on which post or page on your site is getting the most conversions. Aside from the referral page, you can also see the user-agent data for each optin. Using these insights, you can make educated decisions and significantly grow your email list. They have 100% No-Risk 30-day Money Back Guarantee. If you don’t increase your email subscribers over the next 30 days, then they’ll happily refund 100% of your money. Of course no questions asked.